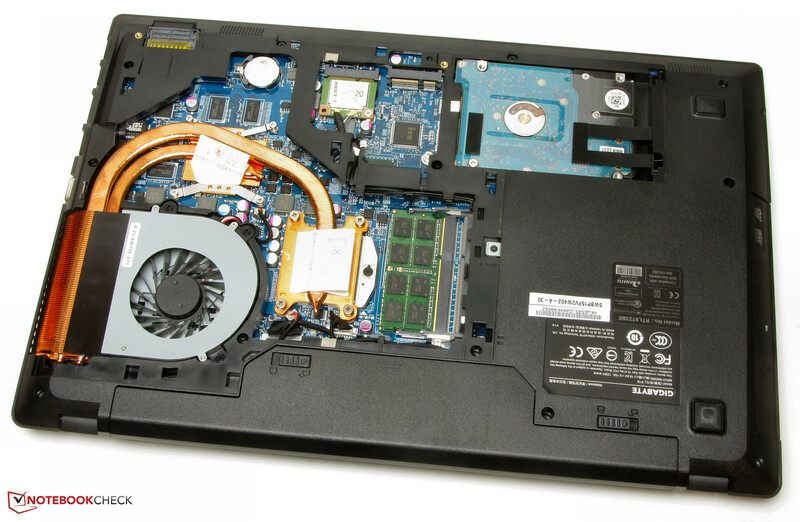 Maintenance friendly The P15F v2 could be seen as the affordable entry model into Gigabyte's World of Gaming laptops. The buyer gets a high-performance computer with good maintenance and upgrade options. Gigabyte has a 15.6-inch gaming laptop in its lineup, the P15F v2. Thanks to a strong processor and a GeForce graphics core, games are rendered smoothly on the screen. Our report reveals whether the laptop has other qualities besides its gaming ability. 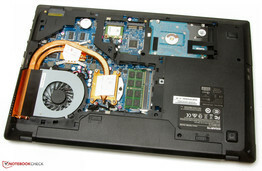 Rivals of the P15F v2 are, for example, the recently tested HP Envy 15-k203ng and the Acer Aspire VN7-571G. Both laptops also rely on a GeForce GTX 850M graphics core. However, unlike the P15F v2, they are equipped with ULV processors. The price range of Gigabyte's laptop (approximately 900 Euros; ~$975) also makes more powerful computers such as Acer's Aspire VN7-591G and Lenovo's Y50 likely competitors. The P15F is made of black plastic entirely. 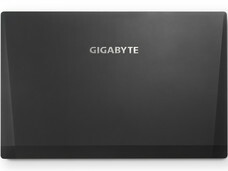 Gigabyte uses matte surfaces. No manufacturing flaws are visible, but there are weaknesses in stability. The base unit can be dented too easily on the wrist rest's front edge. In addition, in view of the price tag of 900 Euros (~$975), it could be more sturdy. Maintaining/upgrading the device is easy. Only two screws have to be removed to open the large maintenance cover. It would be possible to replace the processor since it is in a socket. The empty mSATA slot allows inserting an SSD without having to sacrifice the high-capacity hard drive. A large maintenance cover enables accessing the innards. As well as the usual interfaces, the P15F features an eSATA port for connecting corresponding external hard drives, for example. Gigabyte's laptop does not come with a Windows operating system. Only FreeDos is preloaded. However, it is easy to install Windows since Gigabyte provides drivers for Windows 7 (64-bit) and Windows 8.1 (64-bit). The level, lightly roughened keys of the installed chiclet keyboard have a short drop and clear pressure point. We liked its crisp resistance. The keyboard yielded slightly in the area over the optical drive while typing on it. However, we did not find it annoying. The multi-touch capable touchpad has a surface area of approximately 10.7 x 6.3 cm (~4.2 x 2.5 in). Its sleek surface does not prevent fingers from gliding. The mouse buttons with a short drop and clear pressure point are located below the pad. Gigabyte has installed a matte, 15.6-inch screen with a native resolution of 1920x1080 pixels in its P15F v2. The screen in our review sample (AU Optronics B156HTN03.6) did not impress us. A brightness of just 206.2 cd/m² would be too low even in the low-budget sector. The contrasts of 292:1 and black level of 0.75 cd/m² do not correspond to the laptop's price level at all. The screen's bad impression is continued in color reproduction. The screen displays an average DeltaE 2000 shift of 10.72. Such rates are common in the low-cost sector. A rate of less than 3 would be desirable. Furthermore, the screen exhibits a visible bluish cast. 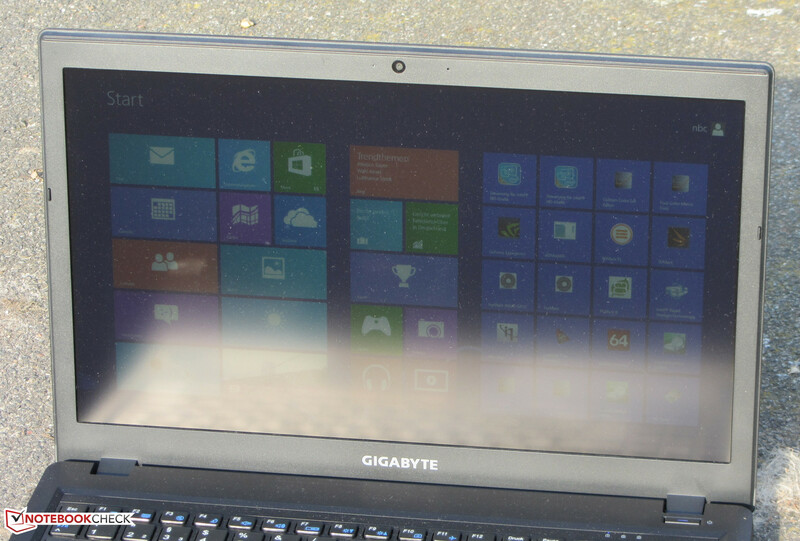 Gigabyte uses a TN screen in its laptop, and consequently the viewing angles are limited. The laptop can be used outdoors, but not in bright sunlight. 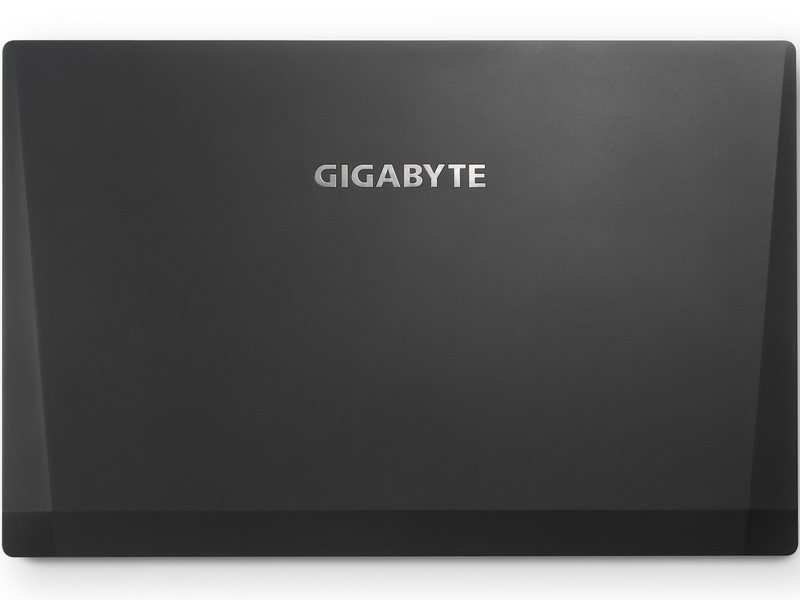 Gigabyte's P15F is a 15.6-inch gaming laptop. Essentially, the computer renders up-to-date games smoothly. Our review sample is available for approximately 900 Euros (~$975). Other configurations were not available at the time of testing. The P15F v2 is equipped with an Intel Core i7-4710MQ quad-core processor (Haswell). Its TDP of 47 watts is significantly higher than that of ULV processors (TDP: 15 watts). The processor clocks with a base rate of 2.5 GHz, which can be increased to 3.3 GHz (all four cores), 3.4 GHz (two cores) or 3.5 GHz (one core) via Turbo. The Turbo is only utilized in AC mode. 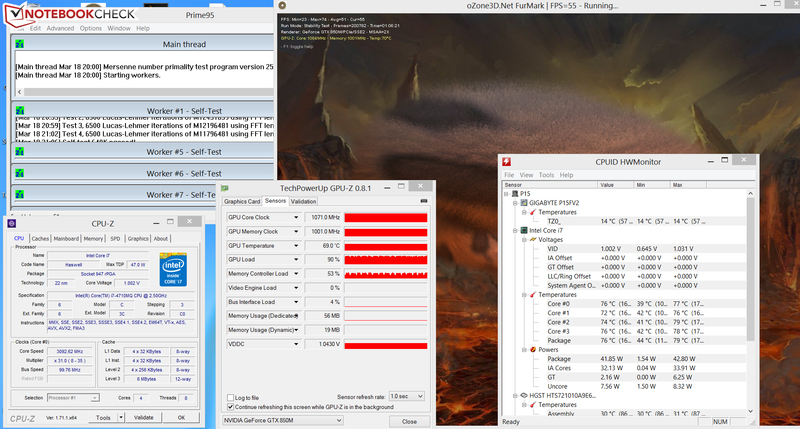 The CPU tests of the Cinebench benchmarks were performed with 3.1 to 3.5 GHz (single thread) and 3.1 GHz (multithread). Therefore, the processor lags slightly short of its potential. In battery mode, the tests were processed with only 1.5 GHz. 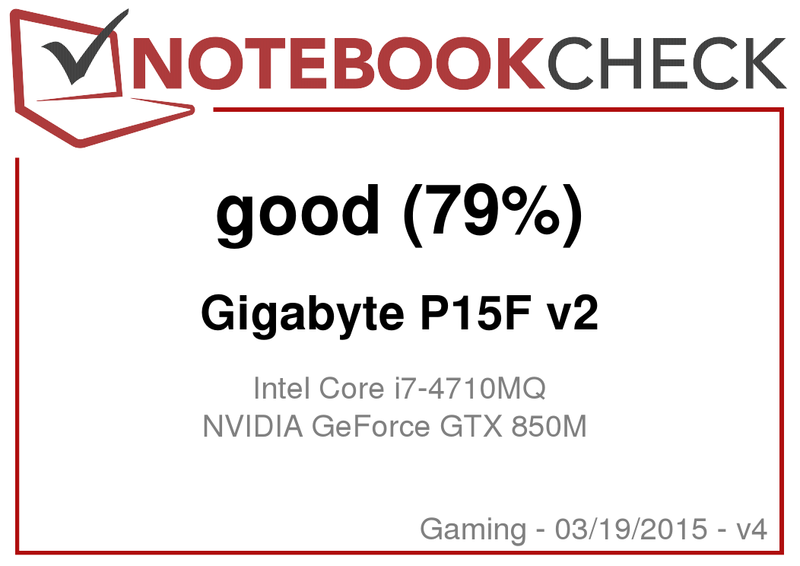 The laptop runs smoothly, and the PCMark benchmarks scores are very good. However, the P15F v2 does not stand out from rivals like HP's Envy 15 and Acer's Aspire VN7-571G, even though they both feature considerably weaker ULV processors. The stronger processor simply does not have any advantages in routine use. 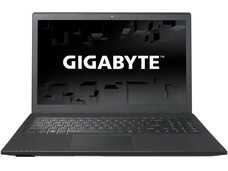 The system performance of Gigabyte's laptop can be increased. The laptop has an empty mSATA slot that can be filled with a corresponding SSD, which could then be used as the system drive. In our review sample, data is stored on a hard drive from HGST's Travelstar 7K1000. It has a capacity of 1 TB and spins with 7200 revolutions per minute. Overall, the drive's transfer rates are good. They are roughly 25% higher than those of 5400-rpm drives. The P15F v2 is equipped with Intel's HD Graphics 4600 graphics core and Nvidia's GeForce GTX 850M GPU. They create a graphics switching solution (Optimus). Intel's chip is used in routine applications and battery mode, while Nvidia's graphics core takes care of performance-devouring applications like computer games. Switching is automatic, but the user can always intervene manually. The GeForce core is located in the upper GPU mid-range. It clocks with a base speed of 902 MHz, which can be boosted to 1084 MHz via Turbo. The 3DMark benchmark results are clearly better than those of rivals like Acer's Aspire VN7-571G and HP's Envy 15 because they both have considerably weaker ULV processors. The P15F v2 copes with computer games easily. Most up-to-date games can be rendered in the HD resolution (1366x768 pixels) using medium to high quality settings. The screen's Full HD resolution can be used in only a few games. The laptop achieves higher frame rates than ULV rivals like HP's Envy 15 and Acer's Aspire VN7-571G. The more CPU demanding a game is, the bigger the advantage of Gigabyte's laptop. It would not even be necessary to pay more to increase gaming performance. Entry-level models of Acer's Aspire V15 Nitro VN7-591G models and Lenovo's Y50 series are already available for around 800 Euros (~$867). Both laptops come with a GeForce GTX 860M graphics core. The fan spins slowly while idling and is barely audible. It is drowned by the noise of the hard drive. It is not surprising that the fan spins much faster during load. We measured a noise level of 53.9 dB(A) in the stress test (Prime95 and FurMark run for at least one hour). After all, a terrifically strong processor and powerful GPU have to be cooled since both operate at full speed. The P15F v2 performed the stress test (Prime95 and FurMark run for at least one hour) differently in AC and battery mode. The processor clocked with 3.1 GHz and the graphics core with 1084 MHz in AC mode. They were occasionally throttled to 2.7 GHz and 1071 MHz in the course of the test. The stress test was performed more slowly in battery mode. The processor operated stably with 1.5 GHz while the graphics core processed the test with 405 MHz. The temperatures are relatively moderate considering the laptop's configuration. Temperatures of around 50 degrees Celsius (~122 °F) were only reached during the stress test (AC mode) in the fan area. (-) The maximum temperature on the upper side is 48.1 °C / 119 F, compared to the average of 39.3 °C / 103 F, ranging from 21.6 to 68.8 °C for the class Gaming. The stereo speakers of the P15F v2 are located on the underside of the front edge. The speakers' sound is acceptable, but it is a bit tinny. The sound improves when the Sound Blaster Cinema 2 software is installed. Overall, the laptop's energy requirement is at a normal level for the installed hardware platform over the entire load range. 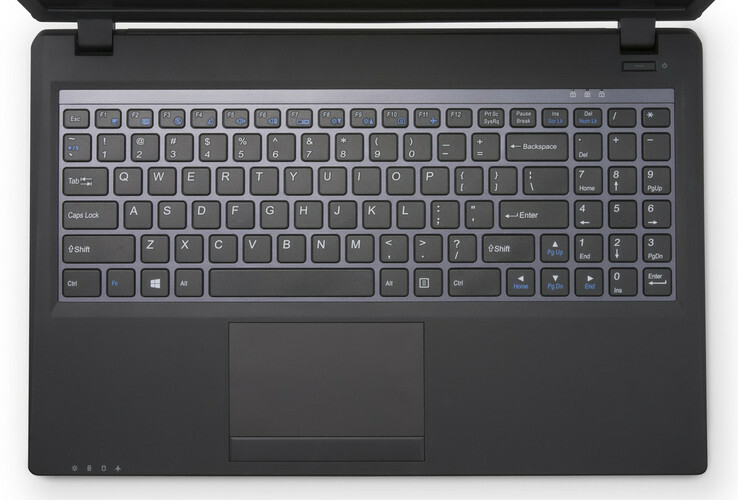 The P15F v2 consumes significantly more power than rivals such as the HP Envy 15 and the Acer Aspire VN7-571G. This is not surprising since Gigabyte's laptop features a standard mobile processor (a model with four cores) while both other rivals are powered by low-voltage ULV processors (models with two cores). Websites are opened automatically every 40 seconds in the real-life Wi-Fi test using the "Balanced" profile, and a screen brightness of approximately 150 cd/m². The P15F v2 managed a runtime of 4:35 hours, which is perfectly fine. After all, the device is equipped with a very strong processor. Gigabyte's P15F v2 is a 15.6-inch gaming laptop. The strong processor provides enough computing power for all conceivable application scenarios. Thanks to the GeForce graphics core, the laptop can render virtually every up-to-date 3D game. There is plenty of storage, which can be expanded via a solid-state drive in the mSATA format. Considering the hardware configuration, the battery life and the casing's temperatures are acceptable. Maintaining/upgrading the laptop is easy thanks to the large cover on the underside. On the other hand, the screen is disappointing: Gigabyte has installed a dark, low-contrast, viewing angle dependent model. More should be offered for a purchase price of 900 Euros (~$975). We would recommend another laptop for users who are not only interested in the gaming suitability of a laptop: Acer's Aspire V15 Nitro VN7-571G. It consumes less power than the P15F v2, and can boast with much longer battery runtimes. It also features a considerably better IPS screen. Moreover, it is 170 Euros (~$184) cheaper than the P15F v2.